Trent Taylor, Team Compete’s MVP in April, is a man who loves to run, something he comes by naturally. Half-Navaho and half-Hopi, Taylor is a great-nephew of Louis Tewanima, a member of the Hopi Nation and a two-time Olympic runner and silver medalist in 1912 for the 10,000 meter run. A Hopi running legend, his family holds an annual race dedicated to him, called the Louis Tewanima Footrace. Taylor, who grew up on the Navaho side, has always loved a variety of sports but his love for running came later in life. It was just five years ago that he ran his first 5K race – fittingly, it was the Louis Tewanima Footrace. Now bitten by the running bug, at age 34 Taylor set goals to participate in an Ironman 140.6 event and to run in the 2015 Boston Marathon. He met his Ironman goal in Tempe, Arizona in November 2014. “My goal was 10:30 and a top 200 finish. I ended up finishing in 98th place and a time of 10:06!! I couldn’t believe it! !,” said Taylor. 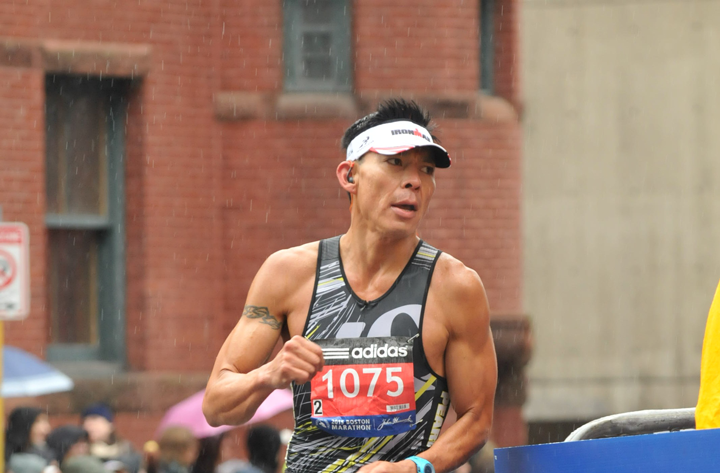 After taking a few weeks for gradual recovery he said “I was ready to focus on the Boston Marathon. Finally it was time to head to Boston with his companion Gary. They visited some of Taylor’s family living in the area and did a bit of sightseeing before race day. The day of the race was cold and rainy but the good news for Taylor was that he loves running in those conditions. After being transported to the race starting point by a fleet of school buses that took an hour, everyone wound up standing under a huge tent for another hour before the race started. When the gun went off, it was too crowded to run fast. But when the crowd began to thin out Taylor picked up his pace to regain time lost at the start. By the halfway point he says he was “looking and feeling pretty good, 1:18:30 a minute and half under goal pace of 2:40.” By mile 20 though, his quadriceps and left foot were starting to feel the beating but the cheering fans and race volunteers help runners keep going. Hitting the home stretch Taylor was feeling strong, crossing the finish line with a time of 2:38:36 – under his go time of 2:40! After a rose, huge hug and a kiss from Gary, he had a hot shower and then they met up with his family for brunch. Taylor heard later that he was the first non-professional Arizona runner to finish the race; he came in 219th place out of 30,000+ runners who started.